Outdoor Kitchens are becoming a normal addition to the American home. They are considered an extension of the indoor residence, acting as a place to grill, dine, and socialize. This isn’t something new though; Mediterranean people have been doing this for hundreds of years. In all actuality, it can be considered a part of their culture. Their outdoor kitchens & grilling areas aren’t as elegant and refined as the Americanized outdoor kitchen. We’ve literally taken it to the next level. The American style custom barbecue island & outdoor living area tends to be a little more stylized and aesthetically appealing. Companies all over America manufacture professional outdoor grills & cooking components. In the last 20 years, it has become a sub-class of the construction industry. More and more people are going all out on their outdoor living areas. The American style outdoor kitchen is unique though, it draws inspiration from multiculturalism. As we all know, grilling and cooking styles vary from region to region. In an American outdoor kitchen, it’s not uncommon to see an Italian style pizza oven next to a Kamado style, or a traditional Japanese style grill. Just as we’re a melting pot for all the amazing people from around the world, we’re starting to see multicultural cooking and grilling influences in the American outdoor kitchen. I must say, it’s an amazing time to build your custom outdoor kitchen area! 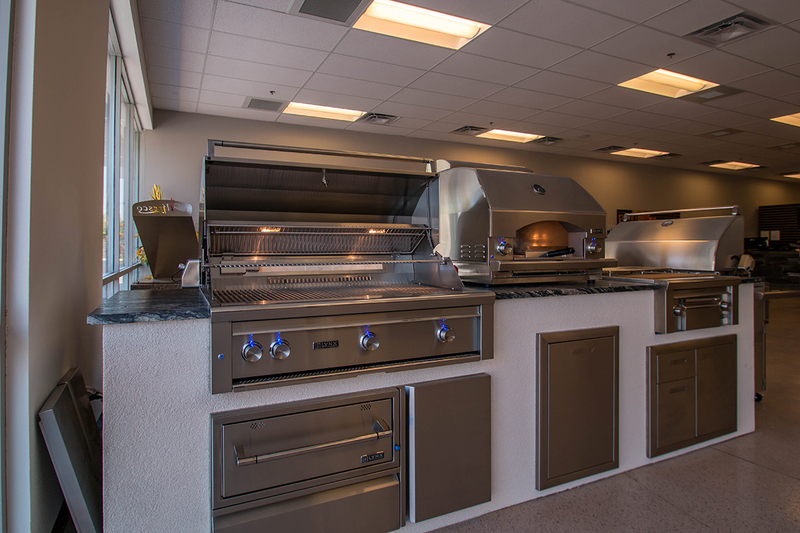 At BBQ Concepts, we manufacture custom outdoor kitchens & outdoor living area components. Everything from the custom designed BBQ islands to beautifully crafted fire features. We build everything you need for your outdoor living area. We’re also one of the largest retailers of industry leading barbecue grills & stainless-steel components. Investing is what Americans do. We want to know that the money we’re putting into something will eventually yield some type of financial gain. Well, you’re in luck. 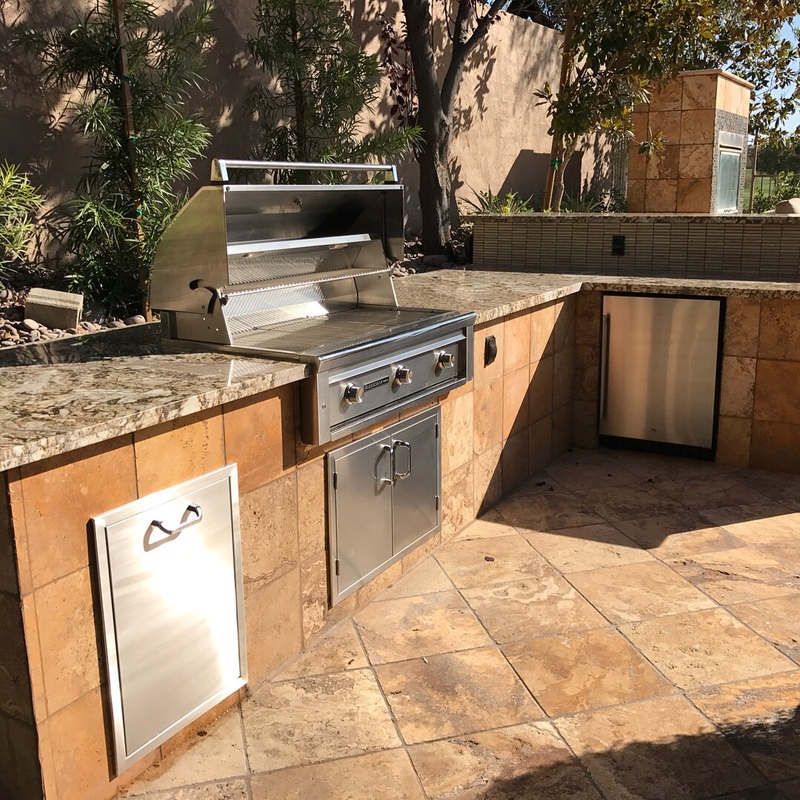 An outdoor kitchen area that’s professionally designed and built will do just that, it will usually raise the value of your home. Not only will it increase the value, but it will be that much more appealing to the “would be buyer” if you decide to sell your home. This is one of those features that can tip the buyer scale in your favor. The outdoor kitchen & outdoor living area is an extension of your home. There’s really no need to add-on an additional room to your residence. At least not one with four walls and a roof. Just build the outdoor retreat you’ve always wanted, one with a kitchen, dining area, and covered patio with lounging chairs. You’ll be able to celebrate family birthdays, holidays, or just plain days in your new outdoor living area. Now, there’ll be less need to vacation, because you’ll absolutely love your new “stay-cation” environment. 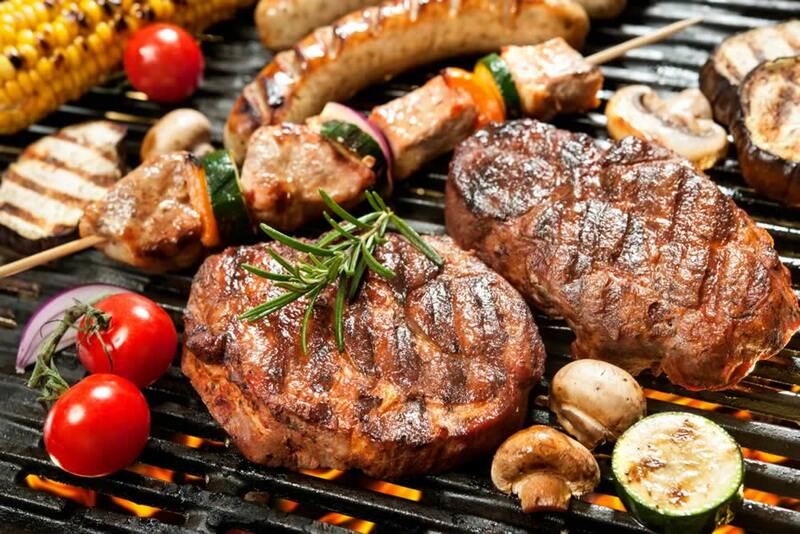 Grilling is already known to enhance the flavor of food. Even more so when the food is from your own grill, it’s just better! It also allows you to experiment with grilling styles along with cooking the food to your own taste. The best part is that you know, without a doubt, the source of your food. You’ll be able to cook much leaner and healthier meals from your own grill too. Since most the fat and grease ends up dripping off the meat, this will make your home grilled meals that much healthier. Did we mention the outdoor entertainment value! Yea, one of the best parts. Your new outdoor kitchen area will allow you to truly entertain your guests. Opening both the interior and exterior of your home to your guests will make entertaining easy and effortless, like a summer breeze. You’ll be a source of envy from all your family and friends. The possibilities are endless. When you cook that fresh Salmon you just purchased from the market, the last thing you’re thinking about is your home smelling like fish for the next few days. We all love the delicious smell of great food, but we don’t want our furniture, clothes, and other valuables smelling like it. One of the best reasons for owning an outdoor kitchen area is this very fact. You’re able to keep those smells out of your primary living area. With an outdoor kitchen area, you can keep your home smelling like “Summer Rain”, or whatever other fragrance you prefer. There are countless other benefits and reasons to build a custom outdoor kitchen & living area. They end up being a special place where you and your loved ones can enjoy each other’s company. This is by far the most valuable aspect of this construction concept. You’ll have a place to socialize, making lovely memories while enjoying the people who really matter in life. We understand our clients and custom outdoor kitchen construction. We want you to be happy with your outdoor living area. To ensure that our customers know exactly what their getting in their custom build. We develop and design with the latest in computer technology. CAD (Computer Aided Design) is a process that allows us to present a design or designs to our customers for approval. This eliminates most misunderstandings or errors that can occur during the outdoor kitchen design process. This happens before we ever start the actual construction process. Between planning, design, and open communication with our customers, we feel confident that we can deliver exactly what you want, and always within your predetermined budget. Are you a do-it-yourselfer? Great, we have design options for you as well. Talk with one of our BBQ Concepts specialists about purchasing an unfinished outdoor kitchen cabinet. We’ll take care of the hard part, you can finish it however you like. Are you a Traeger fan? Yea. we are too! That’s why BBQ Concepts of Las Vegas, Nevada is an authorized dealer of Traeger Brand Wood Fired Grills (Smokers). We’re now one of the largest retailers of Traeger Grills and Smoking Accessories. We sell Traeger brand Sauces, Rubs, Seasonings, Pellets and cooking utensils. Stop in today to browse our Traeger selection.